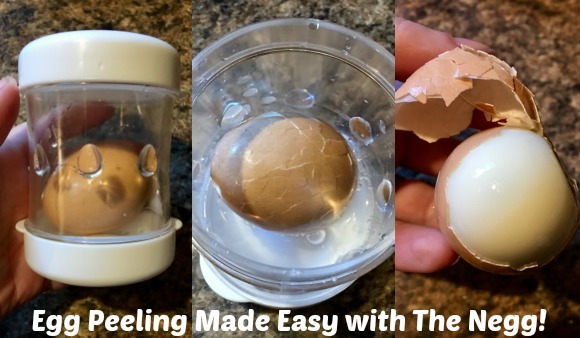 Stacy Tilton Reviews: Egg Peeling Made Easy with The Negg! 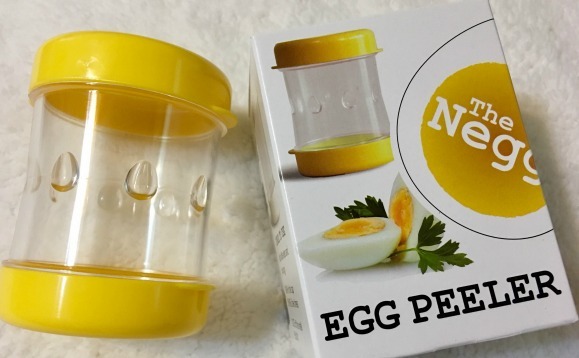 Egg Peeling Made Easy with The Negg! If you've ever tried to peel a farm fresh hard-boiled egg then you know it's not an easy task. Because farm fresh eggs haven't been sitting around for several weeks the inside is nice and full and there isn't a very big air pocket. That air pocket that's found in store bought eggs is what allows them to easily be peeled when hard-boiled. As someone that has chickens I had pretty much given up believing there was an easy way to peel hard-boiled eggs from our chickens. Well unless I let them sit in the refrigerator for a few weeks causing them to be more like store bought eggs..and lets be honest that kind of defeats the purpose of having fresh eggs at home. Then along came The Negg. It was like the kitchen fairies had been watching me struggle and knew I needed a simple solution. And let me tell you The Negg is just that....SIMPLE. In three easy steps your egg is peeled and ready to eat without all of the trials and tribulations. Step 1: Add a little water to The Negg container. Step 2: Drop in and egg and snap on the cap. And there you have it. Take the cap off and your ready to just slide the shell right off you're hard-boiled egg. No muss no fuss! Few snacks are as handy, tasty and nutritious as a hard boiled egg. But let's face it - it can be time-consuming and frustrating to peel eggs. The Negg helps take out the mess to peeling hard-boiled eggs! Simply add a little water and egg inside The Negg, SNAP on the cap, SHAKE a few times and the shell will slip off easily, ready to serve. The Negg's patent-pending design includes egg-shaped bumps on the inside to help facilitate the removal of the shell. Made in the USA and BPA free. It really is a very handy kitchen gadget to have! What a handy dandy gadget!